As if we didn't have enough advertising exhorting our kids to chow down on junk food, McDonald's has harnessed the power of the mobile phone to make its burgers and fries even more appealing. The Japanese arm of the mega-corp has just launched a new mobile website that delivers not just menus, coupons and maps, but also a new level of interactivity. McD's Smile Factory takes photos of grining mugs from a cameraphone and incorporates them into a new range of fun characters that look oddly like Big Macs, French fries and McShakes. Kids get to enjoy making the characters in their own image and then can click a link to download animated versions that cavort across their phones' standby screens, reminding them what to eat next time they're peckish between meals. The characters even recommend what they might like. 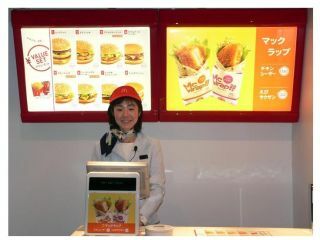 Just how seriously McDonald's takes this kind of marketing can be seen in the fact that the Smile Factory service has been built by a new digital division – Paragraph DDB – set up just for this. Other countries, including China and Australia, will be receiving the same McD's treatment before long, so the rest of the world had better watch out.